Quest Bars are one of the hottest protein bars on the market at the moment, and it doesn’t take much effort to explain why these are so popular. The biggest selling point for Quest Bars is the short and very high quality list of ingredients contained in each bar. It is in fact one of the best ingredients lists in the industry. At the top of the list is a protein blend made up of whey protein isolate and milk protein isolate. These two high quality proteins are followed by isomalto-oligosaccharides which is a prebiotic fibre. Finally, a small number of natural flavours and sweeteners are used to give Quest their distinctive taste and wide array of flavours to choose from! Don't freak out about the 22 g of carbs on the label - it should be noted that around 18 g of these carbs are actually dietary fibre from the isomalto-oligosaccharides. They are not really digested as typical carbohydrates that people tend to try to avoid. Other than this, each bar provides 200 calories, 20 g protein, and 9 g fat (only 0.5 g saturated). Great macros for a snack on the go or after a workout. Thanks to its impressive choice of ingredients and macros, Quest Bars make an ideal high protein snack for anyone, even those on a low carb diet. They are also an excellent healthy snack for those looking to build lean muscle. Despite their simple ingredients list, Quest Bars taste is on point. The texture is soft and chewy with a flavour that is rich, but not too sweet. Sportsfuel recommends trying the Cinnamon Roll, Cookies and Cream, and Choc Chip Cookie Dough. Quest Nutrition have really gone out of their way to make their bars as natural as possible. Not only are these bars natural, they are also gluten free and use some of the highest quality ingredients possible. Despite this, they are still competitively priced compared to other low carb protein bars. It is not uncommon for low carb protein bars to have a lot of dietary fibre, but this often leads to digestive discomfort. The isomalto-oligosaccharides are much better tolerated than other low-calorie carbs so this is not a problem with Quest bars. We can't think of any cons for the Quest Bars, unless you're a hard gainer on a bulk looking to add calories to your diet - then this low calorie, low carb bar probably isn't the right choice for you. 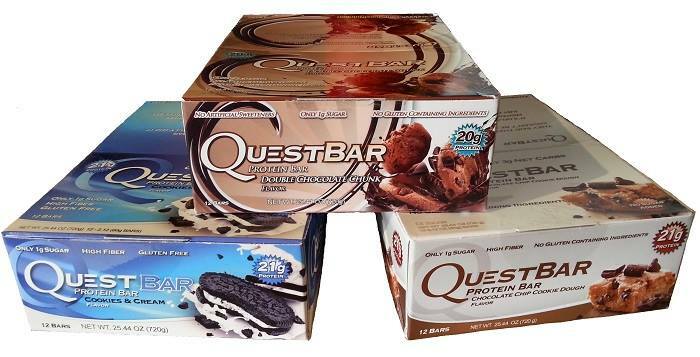 If you are looking for a protein bar to help you bulk, then Quest Bars may not be for you. But for everyone else, it's hard to look past the high quality and delicious taste of Quest Bars, get yours today! Buy Quest Nutrition Quest Bars from Sportsfuel here.